10 x Hanging basket brackets (10 pack), with a powder-coated, Pastel Sage finish, to match the greenhouse. Fitting neatly into the side panes of your greenhouse, Robinsons louvre vents provide valuable extra ventilation to help ensure healthier plants & produce. 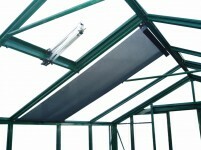 Robinsons glazed, aluminium roof vent - colour coordinated, to match your chosen greenhouse. This comes complete with an ingenious, wax-filled, automatic opener, which expands in the rising heat, achieving a more healthy air circulation. Automatic attachment for a Louvre vent, fits most louvres. Its fully adjustable to open over a range of temperatures. Some drilling is required to fit. This shading will fit Robinsons and Hercules Greenhouses. 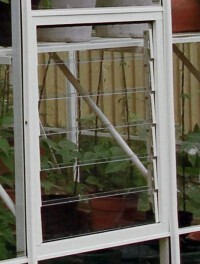 The shading is likely to fit greenhouses with a hole spacing of 620mm. Robinsons internal shading can be used to protect plants from strong sunlight. These roller blinds are manufactured to a very high standard and should last the lifetime of the greenhouse. This shading is desgined to fit one section of glass i.e. a 2ft wide panel. If you wanted to cover your entire roof then you would have to buy more than one. The blinds will go down from the ridge to the eaves. There is extra material on the roll, so that if you wished, it could go down the side of the greenhouse as well. Please note these are only designed to go in the roof of your greenhouse, so some modification may be required if you did want the shading down the side of your greenhouse. The Robinsons Regatta is the smallest in the Robinsons range but has the same high standards you would expect from the brand.The quality is evident in the sturdy construction of the aluminium frame that has extra strong corner sections.The frame has at least twice the metal of most other makes for outstanding durability. The Regatta uses full length PVC cappings that are screwed into place to retain the standard toughened safety glass very securely. This design provides yet more strength and makes the whole greenhouse less vulnerable to wind damage. This is the best quality 5ft wide greenhouse money can buy. 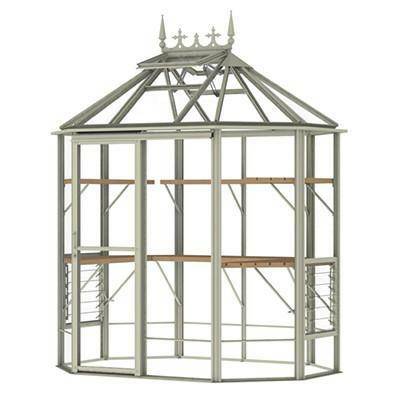 Please note that this staging will only fit Robinsons brand greenhouses only, other greenhouse frames are not suitable to support this staging, and may not be strong enough. Made of Solid extruded aluminium slats, this is a refined, clean, and strong design that is unique to Robinsons. The quality and strength of this staging is the best money can buy. This staging is attached to frame work, so there are no staging legs in the way. 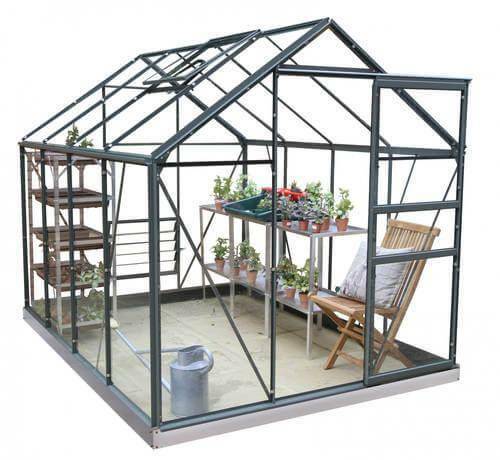 This new Robinsons Victorian range offers you a choice of greenhouses with a distinctive Victorian style. The addition of cast aluminium spandrels at both eaves and ridge strengthens the greenhouse considerably and the extra height created by the more traditional 45 degree pitch to the roof gives more air in the greenhouse, as well as more room for specimen plants. The 45 degree roof pitch is also said to be better for light transmission. Improved features which set the Victorian range at a level above the standard Robinsons range. • Extra colour of heritage Ivory available on Victorian models. • New hinged door with wide access, lock and low threshold. • Choice of glass to ground or dwarf wall models. • 45 degree pitch of roof gives extra height, better atmosphere and more light transmission as well as Victorian feel. • Louvre side vents included as standard. 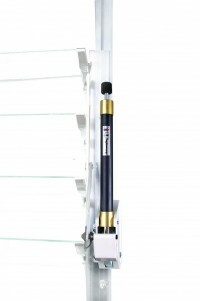 • Extra strong box section ridge bar for rigidity. • Increased number of automatic roof vents. • Improved Cresting & finials option. Flat packed for self assembly. As with other Robinsons the Victorian models include the unique Robinsons box section glazing bars and screw-in PVC glazing capping which neatly and securely holds in the 4mm toughened safety glass. A = Base width: 4,791mm (15ft8). B = Length: 3,872mm (12ft8). C = Eaves height: 1,692mm (5ft6). D = Ridge height: 3,078mm (10ft1). 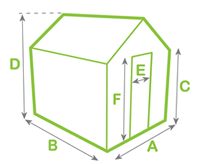 E = Door width: 818mm (2ft8). F = Door height: 1,979mm (6ft5). Ask a question about "Robinsons Roemoor Pastel Sage 15ft x 12ft8"
You will be contacted with a delivery date when your greenhouse is ready. This greenhouse is delivered straight from the factory on dedicated transport. Please write in the comments box at checkout any dates (holidays etc.) you would like us to avoid. Delivery to Northern Ireland may take longer.